The most exciting four mornings of the summer! Children age 4 through grade 6, as well as adult and youth volunteers, have fun with wood working, science, games, crafts, cooking, singing, dance, bells, skits and puppets, while learning and acting to help others. 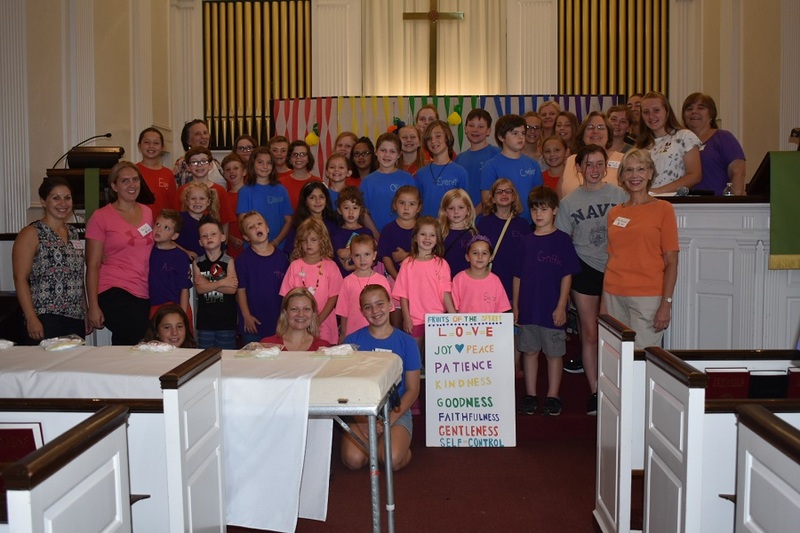 The 2018 Hollis Congregational Church Vacation Bible School (VBS) was held from July 23 – 26 under the theme of “The Fruits of the Spirit”. Highlights included learning about caterpillars and butterflies, parachute games, and making individual candy dispensers from wood. Under the direction of our Chimes and Bells Choir Director, Janet Sterritt, fifth and sixth graders learned to play bells in four short lessons, impressing the audience at the closing program. For the adults involved, one of the most rewarding aspects of Vacation Bible School is seeing last year’s campers become this year’s helpers and leaders. Several activities were led entirely by the 16 local teen volunteers, including singing, dance, games, skits and puppets. Special thanks to all 37 of the adult and teen volunteers! We look forward to seeing the children and volunteers at next summer’s VBS! For more information regarding Vacation Bible School, please contact our Christian Education Superintendents at CE@hollischurch.org or our Minister of Faith Formation at Pat@hollischurch.org.